← Opinion: Has Apple finally lost its shine? The last big Comet to take everyone in the UK (and northern hemisphere) by storm, well it was Hale-Bopp which reached its closest (perihelion) and most spectacular view in 1997. A true sight to behold with its huge, bright tale, the ‘dirty snowball’ was visible on many a clear night and, until now, was the most spectacular Comet visible from Earth for many many years. Enter the new boss of Comets coming out way to a sky near year. Comet ISON may not have a name to role of the tounge like Hale-Bopp or even Hayley, however so far it promises to be totally spectacular and may even surpass previous Comet encounters, with some scientists predicting it will even outshine the full moon! Comet ISON was discovered in Russia by two scientists as part of the International Scientific Optical Network, hence the name ISON. Born in a little known and highly mysterious region of the outer Solar System called the Oort Cloud, a region which has many icy bodies from the dawn of the Solar System. When a star, close to the Oort Cloud (maybe just a few light-years away) moves in proximity to an icy object it nudges it off into an initially slow inward bound journey to the Solar System, it speed increasing as it approaches the gravity’s of our planets, eventually committing ‘suicide’ when it treads too close to our Sun, causing it to burn up. 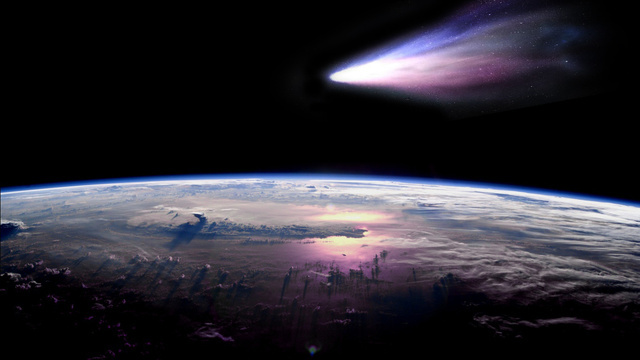 Comets don’t have the nice tail we come to know about them when they are at extreme distance. Only when they come into proximity to our Sun will the Sun’s solar wind (made of fast-moving protons) cause the ‘dirty snowball’ to heat up and cause the it to glow and the corresponding tail which, unbelievable as it sounds, can be many millions of miles in the length. But don’t bother going out now in January, trying to spot it. Its much too far away and only we a decent ‘scope will it be seen, just as a tiny bright dot. You have to wait until late October 2013 to see it in all its glory, but I’m sure many news channels will reporting on it, as will the doom mongers of us. Want to know more about Comet ISON? Want to track it or maybe see what it looks like now, in January?